The High Performance Trunnion Weight Distributing Kit has been revised for 2002. Reese has combined the best of the features from all of our weight distributing kits to create the new High Performance Trunnion Kit. 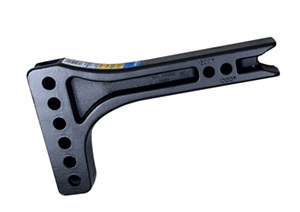 It includes a new head design for superior strength and easy adjustment. The new head includes a forged raised ball platform and forged Trunnion mounts. The channel of the head returns to our "Serrated Washer" design. The serrated washers make it easier to dial in the set up of the HP WD kit. In addition to the changes in the head, the Hi-Performance WD includes the highest rated spring bars per class in the industry. They also feature an integrated cam for easy set up with the optional Reese Dual Cam sway control. Other features include 11-link chains for easier set up on larger trailer frames and innovative snap-up brackets designed for superior strength and durability. 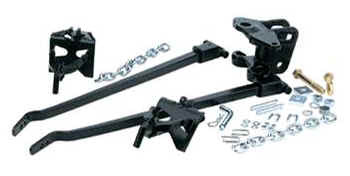 R66131 1,500 # Trunnion Bar WD Hitch Kit 1,500 lbs. 15,000 lbs.